Thank you for your interest in ICY COUTURE! Your satisfaction is our top priority! If you have a problem with a transaction, just let us know and we will work with you to resolve the issue. Please read carefully the terms below. BY HAVING SUBMITTED YOUR PURCHASE, YOU AGREE TO BE BOUND BY THE TERMS AND CONDITIONS OF ALL THE POLICIES OF THIS STORE, EACH AS MAY BE MODIFIED FROM TIME TO TIME. IF YOU DO NOT AGREE TO THESE TERMS AND CONDITIONS, YOU MAY NOT PLACE YOUR ORDER. ICY COUTURE RESERVES THE RIGHT TO REFUSE SERVICE TO ANYONE. The terms, policies and conditions (collectively known as "Conditions") described below govern the use of this site (referred to as "Icy Couture" or "icy-couture.com"). Your use and/or placement of any order indicate your acceptance of these Conditions Icy Couture of California. All fraudulent credit card charges are investigated by our Legal and Technical departments. Please note that we record all computer IP addresses during transactions and any fraudulent action shall be reported to authorities immediately for investigation. ICY Gift Certificate is not refundable or redeemable for cash. Please treat your Gift Certificate number like cash because it is not replaceable if used without authorization. ICY Couture is a trademarked, internationally and nationally well known Brand Name. Your fancy custom gift, made with Swarovski crystals, will have ICY logo as a prove of genuine ICY Couture made product, which is not to be removed or tampered with. All ICY phone covers, bedazzled license plate frames, and other gifts, come with this cute 3D diamond-shape logo. On dark backgrounds we add Black Logo with silver Brand Name; on light backgrounds we use Silver Logo with red Brand Name. Look for this logo to avoid cheap Made-in-China imitations of ICY Couture, which will fall apart in a month. Car emblems dont come with our logo. We do not manufacture auto parts, we just beautifully decorate Authentic parts with Swarovski crystals. All trademarked Auto Logos belong to their respected owners. Only ICY COUTURE gives Lifetime Guarantee on all our custom work made with Swarovski crystals only! If something happens and you loose crystals after dropping your item, or simply with wear and tear, just send it back to our studio, and we'll fix your design for you for free for as long as you own your item, even years later. Repairs time may very and can be up 1-4 weeks, depending on time of the year and our availability. Call 877-707-0429 or email to let us know that you'll be shipping your ICY item to get it fixed, so you get correct shipping address and we know to expect it. With your package, please include prepaid shipping label addressed back to you, which you can print on www.usps.com. OR add a note with your contact info and $10 for ground shipping charges back to you in form of check or money order made, payable to ICY Couture. ALL CRYSTAL REPAIRS ARE FREE, BUT IF YOU LOST LOST ICY SCREW CAPS, OR ANOTHER LARGE ELEMENT AS CROWN ETC, THOSE ITEMS ARE SOLD SEPARATELY. We highly recommend to get tracking number and insurance for your package, going both ways, as we are not responsible if it was lost or broken while not in our possession. IF YOU INCLUDE STAMPS AS PREPAID SHIPPING METHOD BACK TO YOU, YOU ASSUME RESPONSIBILITY IF YOUR ITEM IS LOST AT THE TIME OF SHIPPING. Please send your item securely wrapped in the box (not envelope) as we are not responsible if your item will get damaged on the way. REPAIRS WILL NOT BE ACCEPTED if you negligently send your item without care! WE ARE NOT RESPONSIBLE FOR YOUR, OR POSTAL SERVICE NEGLIGENCE! Keep in mind that we dont save envelopes and boxes, ICY COUTURE does not assume responsibility for items which come without a notice, name, or a phone number inside of your package and is not claimed within 30 (thirty) days from the day we have received it. ** Auto Icing is covered by lifetime warranty from wear & tear only. We do not repair Auto Icing items after accidents or reckless driving. Its very hard to show true colors of Swarovski crystals on photos, shades of which will change depending on color of surroundings, light, time of a day and your browser settings. Please be advised that colors on pictures could appear lighter, darker, or even shades off from true colors you see in person. To make accurate color selection, please see Swarovski Color Chart here, or make a reference to our Drop Down Menu in Crystal Color option on each item's page. Keep in mind, we will only take responsibility if we made your item in a different color than you have selected at the checkout. Every ICY item will come to you with extra crystals in every size and color used in that design. It will help if you save them, in case you want to put a crystal back, if one pops-out. One could find that easier instead of sending their beautiful crystal case. In that case, you can get a special gem glue here. If you run off extra crystals we sent, you can request us to send you more. DO NOT use crazy glue, or a glue that is not meant to be used on crystals! You will not only ruin your crystals but also the case itself. We will not repair designs that were ruined with crazy glue, or other glue of that nature. Also, we WILL NOT REPAIR designs in instances where our design was damaged through uses for which it was not intended, misused, mishandled, neglected, modified or tampered with. REPAIRS WILL NOT BE ACCEPTED if you negligently send your ICY item in an envelope, or box, where it was not securely wrapped! ITEMS MADE WITH REGULAR RHINESTONES AND/OR ELEMENTS THAT ARE NON-SWAROVSKI ARE COVERED ONLY FOR 3 MONTHS FROM THE TIME OF PURCHASE. We use the same strong glue as on regular rhinestone items as on items made with Swarovski crystals. 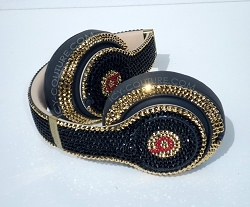 Since regular rhinestones and non-Swarovski elements are not guaranteed by their companies which makes them, we can not predict how they will hold up in different weather conditions, thus we can not guarantee to you that they will hold up as well as items made with Swarovski crystals. This forces us to limit our warranty to 3 months from the day of purchase. If you are looking for long term investment, its always best to choose items made with Swarovski over regular rhinestones or elements. Since we do not manufacture items such cases, computer mouse, pen, cameras etc, we can not give any guarantees to the product that was made by a third party. We warranty defect in Workmanship Only, when its made with Swarovski crystals, and DO NOT cover physical abuse, misuse, accident, manufacture defect, or normal wear & tear of items that was not made by us. Portraits show creativity and talent of the artist and are subject to an artist's vision which is not to be disputed. Portrait, as any highly detailed design - reproduction of a person, or pet - has the signature look exclusive only to ICY COUTURE. When you place your order for a Portrait, you agree that you reviewed examples of portraits on our website and you accept the style of the recreation. Before we send it, the artist did absolute best to make re-creation as close to the original photo as possible. There will be absolutely no refunds, or exchanges on any custom item. Depending on difficulty of a design, please allow extra time for an artist to create in crystals your timeless ICY piece of art. Once item is in the process of getting made, there will be no refunds! We are trying our best to make you happy and your shopping experience with us as pleasant as possible providing you with higher-end quality product. If you find a blemish in our work, please return your item to our studio (you can find return address in the original invoice which was sent with your package) and we will fix it for you. All returns are accepted within 5 (five!) days from the time you received your item. Your returned item must be sent to us in the same perfectly new condition as you have received it, or your return will not be accepted. Before sending your package, please call to 877-707-0429 or email customerservice@icy-couture.com and let us know what seems to be the problem. If you prefer to email, we will make every effort to respond to all customer service inquiries within 12-48 business hours. Please keep in mind that since your ICY item is CUSTOM MADE PER EACH CLIENT'S REQUEST, THERE WILL BE NO MONEY REFUNDS, as we already invested in crystals and designer's work. We we remake your item only if you find blemish in our work. We advise you to THINK TWICE about design/colors of your choice as ICY COUTURE IS NOT LIABLE FOR THE CHOICES YOU MAKE. There will be no exchanges from one design/color combinations to another! When placing your order, please make sure to select correct model of your phone as we are not responsible for your mistakes. When you place your order online, within few minutes, you will be emailed order confirmation. Please check your email inbox (or spam/bulk folder), and go over your order, making sure all is correct. If you did found a mistake in your shipping address, phone model etc, please notify ICY COUTURE immediately and no later 12 (twelve) hours after your order has been placed, so we could edit your order before your item has been created. We regret to inform you that we can not exchange already made product, as we already have spent our money, time, and effort to create the peace of crystal art per your special request . Exchanges will be made only if it was our fault and we didnt follow exact details of your order. Our items must come back in the same condition it was sent to you. In no event we accept returns to instances where our design was damaged through uses for which it was not intended: misuse, mishandling, neglect, design modification or tampering etc. If you changed your mind after you already placed your order, please contact us immediately by phone 877-707-0429 and no later 12 (twelve) hours after your custom order have been placed and we'll issue a refund. Since your custom item is made per your request and especially for you, cancellations are not accepted after your item has been already made, or started to get made. Sorry, we can not refund other your country customs and shipping. All sales on discounted , make-an-offer, DIY items, or other marked items are final. There is no refund, return, or exchange on those items. IF YOU CHANGED YOUR MIND ON AN ITEM THAT IS NOT CUSTOM MADE, SHIP YOUR ITEM WITHIN 30 DAYS IT AND WE WILL ISSUE REFUND AS THE STORE CREDIT. Shipping and tax charges are not refundable. Customer pays for returns. When you select shipping method for your package, you are selecting actual shipping time after your item is complete. If you need your item before certain date, please let us know that in your order. Since we work on items in the order received, current production time will be displayed on Thank You page, once your order is placed. Our production time vary depending on demand for our service and and time of the year. Please make sure to prepare way in advance for Holiday seasons. Keep in mind, when you pay for faster delivery method with a shipping company of your choice, THIS PAYMENT DOES NOT GO TO US as a faster service charge. You select actual shipping time for your package to be shipped with that method AFTER your item is custom created! We can not make custom hand made items in rush, as we design items in the order we received it. We highly advise you to prepare for Holidays seasons few months in advance to make sure you get it in time and to avoid longer waiting time! Disclaimer: Packages left at the destination location due to no one being available to receive them and are subsequently lost or damage, are deemed delivered and then borne by the customer if a "Signature Required Request" was not made at the time of shipping. (i.e lost packages from carrier leaving them outside of your location, because no one is available to accept, are customer's responsibility! ICY Couture is a well known brand name company which ships packages to most countries every day. To make sure our clients dont get charged customs for buying from an other country, we usually send items marked as a gift. Sometimes customs may call you and ask what you are expecting. Depending on your answer they may determine to charge you taxes or not. If the charges are unavoidable , it is the buyers responsibility to pay customs duties and taxes. The price for shipping vary from country to country, it is calculated at the checkout when you type in your address. Disclaimer: WE ARE IN NO WAY RESPONSIBLE FOR LOST/BROKEN PACKAGES DURING SHIPPING PROCESS. PLEASE MAKE SURE TO INCLUDE INSURANCE FOR FULL AMOUNT OF YOUR ORDER IN CASE THAT HAPPENS TO COVER YOUR LOSES. We lovingly package all our items and ship orders in secure boxes with lots of peanuts and bubble wrapping with "fragile" stickers/tape on boxes. If a product is damaged in shipping, it is a customer's responsibility to file a damage claim with that carrier for a full amount package was insured. You may place your order over the phone 877-707-0429, email sales@icy-couture.com , or online. Currently ICY COUTURE accepts AmericanExpress, Visa, MasterCard, Discover and PayPal. ICY COUTURE is Google's Secure Checkout preferred customer. ICY COUTURE is required by law to charge California state residents 9% sales tax on all products. Sales tax will be automatically added to orders shipped within the state of CA. All orders shipped outside of CA are not taxable. It is an international customer's responsibility to pay custom's taxes/duties that may occur. Your personal information is not shared, rented, or sold to any other party. We only request your information we need to process your order. THIS WEBSITE IS PROVIDED BY ICY COUTURE ON AN "AS IS" BASIS. ICY COUTURE MAKES NO REPRESENTATIONS OR WARRANTIES OF ANY KIND, EXPRESS OR IMPLIED, AS TO THE OPERATION OF THE SITE OR THE INFORMATION, CONTENT, MATERIALS, OR PRODUCTS INCLUDED ON THIS SITE. TO THE FULL EXTENT PERMISSIBLE BY APPLICABLE LAW, ICY COUTURE DISCLAIMS ALL WARRANTIES, EXPRESS OR IMPLIED, INCLUDING, BUT NOT LIMITED TO, IMPLIED WARRANTIES OF MERCHANT-ABILITY AND FITNESS FOR A PARTICULAR PURPOSE. ICY COUTURE WILL NOT BE LIABLE FOR ANY DAMAGES OF ANY KIND ARISING FROM THE USE OF THIS SITE, INCLUDING, BUT NOT LIMITED TO DIRECT, PUNITIVE, INDIRECT, INCIDENTAL, AND CONSEQUENTIAL DAMAGES. By placing an order, the Customer Agrees that ICY COUTURE, its employees, or affiliates are not liable and will not cover any other types of damages or "claims" that may have arisen as a direct or subsequent result to self, of product use to other personal property of any kind. By submitting your order, customer agrees to our shopping policy and will hold ICY COUTURE harmless of any other claims or damages arising as a result of product purchase or use.